Main features and pro/pons of each island, includes dive shop & charter recommendations for each island. There are direct flights from the US mainland and major cities in Asia to the Big Island, O’ahu and Maui. Know of a dive shop, charter, or attraction that should be mentioned here? We’d love to hear it! It’s pretty darn big for an island: Our favorite part of the island: Kailua-Kona (AKA Kona, FYI Kailua is on a different island) or nearby Keauhou. Great climate, near the diving, near activities, near the airport (KOA). Hiking: from short day trips to some pretty epic and challenging stuff. Mer’s fav: Pololu Valley (day hike). Dry caving. There are some show caves, but if you’re a serious caver, we can make introductions to the local grotto and conservancy. Attractions: Volcano, Mauna Kea, black sand beaches. Shore diving is fairly consistent year-round. Even in winter on a big swell day we have a least a site or two. Manta Ray night dive, this is a bucket list item! Best support for technical diving. Great blend of civilization, dive quality, good food, without too much traffic stress. More about Kona and Kona Diving. Useful Kona links: includes more recommendations and travel tips. Please tell them Mer sent ya for best service! Kona Diving Company: Full-service PADI 5-star dive center and awesome charters. They book up quickly! Book early. Great guides, small groups, unrushed dives. They cater to both divers and snorkelers on the Manta Night Dive. Nitrox is available. If you want 32% for both dives (instead of 32% then 36%), just ask when you book. If Kona Diving Company is booked full, please inquire for alternatives. Wet Rocks Diving: Rec/Tech Guiding from Shore or Boat. GUE Instruction. 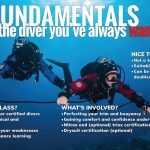 Opua Private Scuba: Gerard Newman & Co – Shore, DIR Recreational, and Tech Guiding. NAUI Instruction. Rebreather support and trimix. Great alternative when Wet Rocks Diving is not available. World-class hiking: Kalalau Valley and on Wikipedia. Some hikes are moderately strenuous or require overnight camping. Both have nitrox and Ni’ihau charters. May have to insist if you want to use nitrox on wall dives. Traffic, Contra-flow, and more traffic, people and traffic. Decent hiking: Mer’s favs – Aiea Loop Trail and Kaneohe Pillbox Hike. Shore diving in the winter can be challenging: winter swell plus small island doesn’t work well. Island Divers Hawaii: PADI shop. Boats out of Hawaii Kai and Honolulu. Nitrox available, request well in advance. It feels like LA, but on an island. I feel like a number here and the traffic on leeward side can be rough. Dive Challenges: Boats leave super early 5am due to afternoon winds (which is good if you’re jet lagged), capacity of other divers, weather on Molokini Back Way, nitrox availability. Dive Weaknesses: Shore diving visibility is not good if they have gotten rain on leeward side. B&B Scuba: The most “technically” minded.